Last weekend's tie to the Colorado College likely sealed the fate for the Julie and Spencer Penrose Memorial Cup. With the Bulldogs now two points outside first with four games left I would be surprised to see the Bulldogs leap back into first place. Bulldog fans will be cheering for their team to win out and for the Huskies and Mavericks to beat the pioneers the next two weekends. The season is not over so there still is a chance. Miami @ Minnesota Duluth: The Bulldogs return home for a rare Thursday and Friday series. All bets are off due to the unusual schedule for NCHC teams and the whole body clock excuse. The Bulldogs are a better road team them home, but the Redhawks have not been a good road team this year. Split. Nebraska Omaha @ North Dakota: The Fighting Hawks are struggling down the stretch here but they have had the Mavericks number this year. I think the Mavericks gets some redemption with a split. 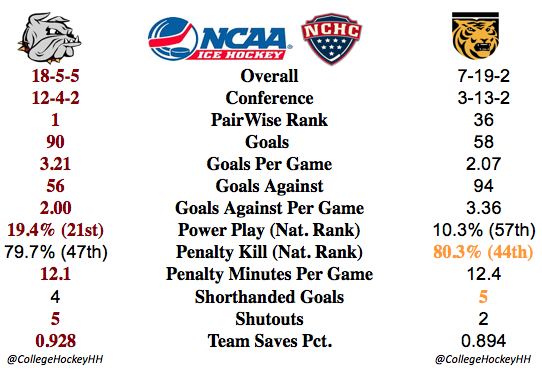 Western Michigan @ Colorado College: Will the Broncos be able to get a couple big wins on the road this weekend? The Tigers only have one win at home this year and I think the Broncos will take it to the Tigers for a sweep. St. Could State @ Denver: The Huskies are Jekyll and Hyde this year, I am not sure what team will show up in Denver. They are a good team, so I will pick safe with a split. The Bulldogs have reached their final bye weekend of the season. I personally think this comes at a good time. The team is currently #1 in the polls, the pairwise rankings, the NCHC conference standings and riding a seven game unbeaten streak; so one might say don't stop while you are hot, but a break should help for the final stretch run. There are six conference games left for the Bulldogs prior to the conference playoffs and these will be very important games. League wide you couldn't ask for better match ups especially considering they the way the standings are bunched from 3rd to 7th place only being separated by five points. It should be a great run for the Julie and Spencer Penrose Memorial Cup. 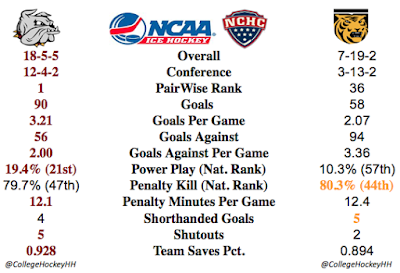 Colorado College vs #2 Denver (home/home): The rivalry factor with the home/home format could be an equalizer leading to a split, but I will go with a Pioneers sweep for the Golden Pan. Miami @ St. 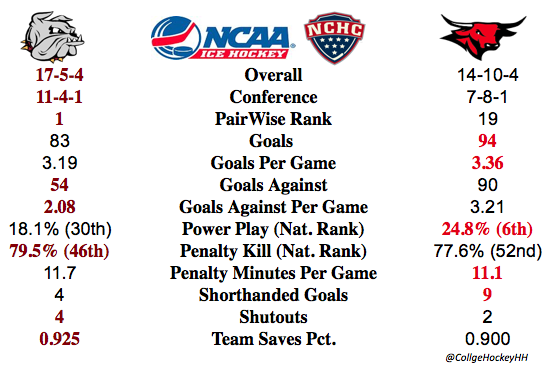 Cloud State: The Redhawks have been very competitive both at home and on the road recently. Not knowing what Huskies team will show up leads me to believe this will be a split. #8 Western Michigan @ Nebraska Omaha: The Mavericks have struggled at home and the Broncos haven't been very good on the road lead me to believe it will be a split or a pair of ties. Split. In arguably the most important North Start College Hockey Cup tournament ever the Bulldogs finished the mission of winning the tournament. This in all accounts gives the trophy to UMD to keep for perpetuity. This will be a nice addition to the trophy case. More importantly the Bulldogs got two more wins and are now on a five game winning streak. Now the team enters the final push with four series of conference games for the Julie and Spencer Penrose Memorial Cup. This trophy is much more meaningful and should be the next milestone the team is eyeing. Nebraska Omaha @ #1 Minnesota Duluth: I am concerned about a let down and the general home funk that the Bulldogs seem to get when going back to Amsoil Arena. Having said that I will pick the Bulldogs who are the better team to get a sweep. St. Cloud State @ #13 North Dakota: The Fighting Hawks continue to be inconsistent after split in Colorado Springs last week. 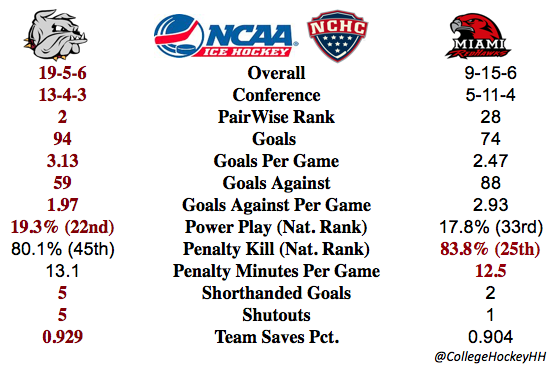 The Huskies are a very good 7th team in the NCHC. This will be a split. Arizona State @ #9 Western Michigan: The Sun Devils picked up arguably their best win since joining D1 last, season beating Quinnipiac 4-2 last weekend. This weekend they go to the Harry W. Lawson Ice Arena and will hear the chants from the Lawson Lunatics. There will be home cooking and the Broncos will sweep.